It’s almost New Year’s Eve and I’m not sure about you, but the turn of the new year always makes me reflect. How was the last year for you? Did you achieve everything you wanted to? Did you learn and grow? Often this reflection is filled with what-ifs and resolutions to make the next year even better. 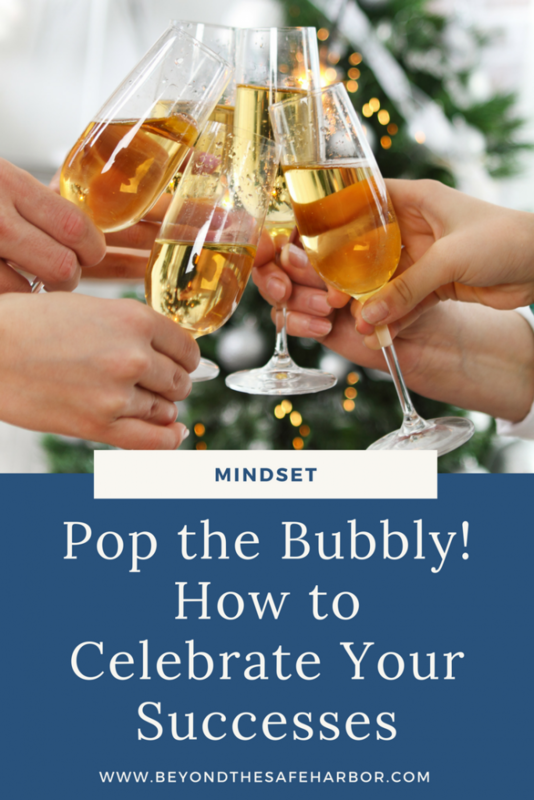 But what if you took the time to celebrate your successes? And to bask in the glow of the great things that did happen this past year? With an eye to focusing on what we have to celebrate, here are some ways to revel in your successes. Chances are, you aren’t fully aware of all the wins you have to celebrate. Some of the recent or bigger ones may come to mind, but dig deeper and truly reflect on how far you’ve come. Where were you a year ago? What strides have you made? Are there things you’ve accomplished that you didn’t think possible? You may even find that an area of disappointment may be ripe with wins. For example, I often wish I was further along and had seen more success with my blog. I’m notoriously hard on myself and am well aware of the areas in which my blog hasn’t “succeeded”. But when I take a step back and look at the progress I’ve made, it’s outstanding. In February, I didn’t even have a blog name, target reader, theme, or domain. I had zero new content and only a few ideas for posts. Fast forward to the end of the calendar year, and I’ve done all those things! I’ve built a blog from the ground up, with a strong foundation and strategic processes in place. I have an editorial calendar full of ideas and have been working ahead to give myself more flexibility in my schedule. I’ve learned a tremendous amount about blogging and myself, and every day make incremental strides towards my broader goals. Spend some time reflecting on the strides you’ve made. You may be surprised at how many more wins there are, just beneath the surface! If you don’t keep a gratitude or success journal, now is a good time to start one! (Plus, how cute is this one??) I actually have a “Happy Emails” folder in my email where I file any success-related emails or notes of thanks. What’s great about this is that it acts as a reference for the future. If you’re having a bad day or experiencing self-doubt, you can open that journal or folder and reflect on some of the wins you’ve had. Now that you’ve identified your wins, it’s time to tell people about them! Share them with a friend, partner, or family member. Talk to them about what these wins mean to you. And if there are people along your journey who helped make your successes happen, thank them! This is the perfect time to express gratitude and give thanks meaningfully. You may also find that sharing your results helps others who are going on a similar path. Do you have a mentee you could share your story with? Or a platform you could use to spread your learnings? Magnify the impact of your results by giving others the tools to achieve greatness too. It wouldn’t be a celebration without some type of treat! Reward yourself with anything from a massage or something tangible, to a cool experience. Don’t have the budget? Treat yourself to taking an afternoon off, indulge in an at-home movie marathon, or sleep in. Whatever you do, enjoy it! The new year poses a great opportunity to look back and reflect. Using these tips, give yourself a pat on the back for all that you’ve achieved! Here’s to building on this success and making 2018 a force to be reckoned with.